Thirteen members of this ensemble sit in chairs that flank the stage, from which they take turns stepping into an assortment of quirky, memorable characters in a series of eight scenes. The cast is accompanied by two musicians that set the mood and mark scene transitions with Iranian string instruments. There is no conventional storyline. Instead, we have this intriguing framing device: an obscure, fictitious playwright’s body of work. Each scene opens with an introduction contextualizing it by revealing the playwright’s intentions and alluding to specific language or concepts contained therein. The scenes, thematically linked and exploring aspects of private and public Iranian life, are explicitly acknowledged as theatre. 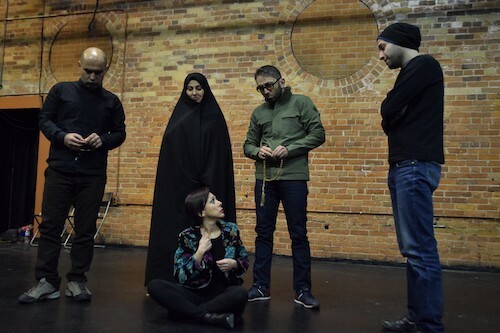 They are fragments of plays that were never completed, penned by an impassioned yet insecure playwright who sought to reflect and challenge Iranian society, but who, regrettably, faded into obscurity. We begin with a scene that is absurdist in tone and presentation. Various family members go though the motions of domesticity, but instead of a realistic depiction, they vocalize the mean and insulting thoughts that would, in reality, have gone unspoken. The affect is jarring, though undeniably funny. It is in this depiction of his early work where we can recognize that the playwright’s technique was somewhat crude and inelegant. As we progress through these incomplete works, presented in chronological order, his writing becomes more subtle and complex, more touching, even sinister. There is a great cumulative effect here as we get a sense of him, catching brief yet vivid glimpses of Iranian society through his lens, and appreciating the improvement of his craft over time. This show would be most consistently accessible to audiences more familiar with the culture. Not being Iranian, I was often conscious of that obstacle between myself and the content. That obstacle, though, is far from insurmountable, as there are many haunting, beautiful insights that transcend it. More importantly, it is worth the effort, especially for those unfamiliar with Iranian life, to experience and process those insights. Despite the consistently alienating aspects of the presentation, it never feels preachy or esoteric because of the playful, anarchic quality to Yaghoubi’s text and direction. And the performers bring an undeniable warmth to these highly stylized scenes. I didn’t always grasp the many implications of each scenario, but I found them consistently compelling and teeming with resonant ideas. The Only Possible Way has a very limited run. If you’re interested, don’t hesitate! Tickets can be purchased through the Box Office, by phone 416.368.3110 or online.